White Chocolate Raspberry Brittle is great to nibble on or it can be used to decorate a cake or tart. This brittle is quite eye catching with its lovely swirls of ruby red raspberry sauce running through thin slivers of white chocolate. I especially like how the raspberry sauce gives a tangy jolt of flavor against the sweetest of the white chocolate. White Chocolate Raspberry Brittle: Line a baking sheet with parchment paper and set aside. Melt the white chocolate in a stainless steel bowl placed over a saucepan of hot water, making sure that the water does not touch the bottom of the pan. Stir until smooth. Watch carefully as white chocolate burns easily. Remove from heat, and using an offset spatula, spread the chocolate into a 10 inch (25 cm) square on the prepared baking sheet. 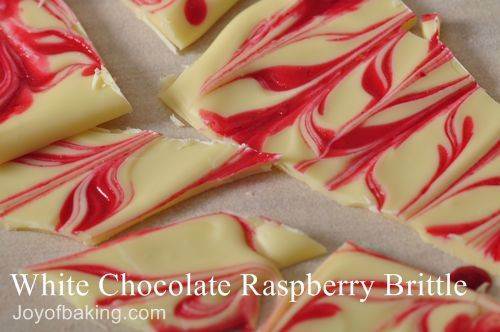 With a spoon drizzle about two tablespoons of the raspberry sauce over the surface of the white chocolate. Using toothpick or bamboo skewer swirl the raspberry sauce through the chocolate to get the desired design. Let the chocolate brittle set at room temperature for 2 to 3 hours or until firm. Cut the brittle into the desired shape and size pieces and then peel the parchment paper off the brittle. The raspberry sauce is slightly sticky, so handle carefully. Store in the refrigerator in an airtight container for several days. Preparation time 45 minutes.